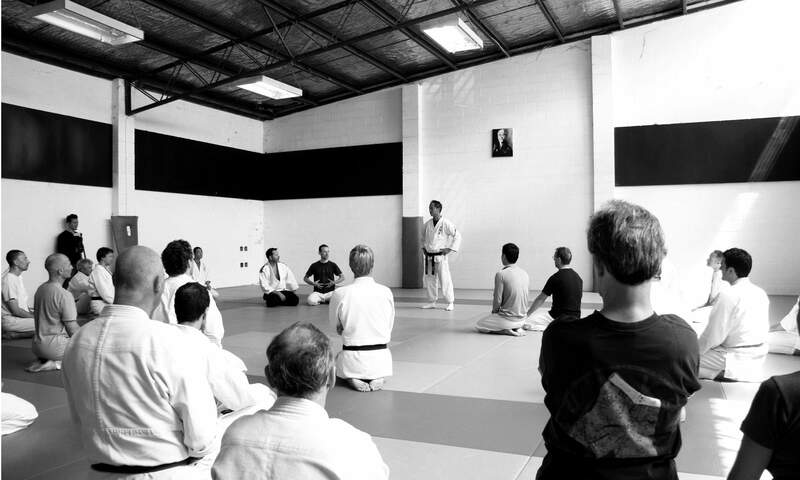 Here at Aunkai we place heavy emphasis on training that allows you to realize principles within that are at the foundation of a bujutsu body. This not to mean we wish to build our bodies in ever more complex ways. Rather, we seek to understand what is “natural” within our bodies, and study how to create the simplest, most stable body possible. The goal is to shave off excess rather than build and tack on more. By making the body mold within a certain frame, it can start to acquire the correct foundation. Only then will it develop and undergo the neuro-muscular change required for a Bujutsu body. By slowly training movement, breathing, and sinew, we create a body that remains natural in movement. At the same time this training allows us to understand where we possess unnecessary tension and habits that run through the body. Each frame (katachi) within the Aunkai has meaning. The frame is simply a guide to correct oneself. It helps to stabilize the body in different directions, fix habits and imbalance in the body as well as realize body movement and intuition appropriate to Bujutsu. Through training the body in different frames, we develop the body in a all around manner. “Body Connection” is not simply about connecting the body powerfully. It is also about understanding the balance required of that body, realization of the axes governing the body, as well as the role joints play in the structure of the human body. It is a method to realize all these things in one exercise. As you delve further into the exercise, you will find you realize how the upper and lower, left and right parts of the body connect as a whole. This leads to realization of how force acts and reacts within the body, how force is received in the body, as well as how the body sends force. Stillness training places the body in a frame that allows it to identify those parts necessary for utilizing force. By making the body utilize opposing physical systems to keep the body unmoving when it is in motion, it allows the practitioner to further understand how his body settles naturally into place. This is a method to develop a core within the frame while increasing the range of motion in which the body adjust and maintain proper structure. This exercise is not about relaxation. It is about how well you can keep your core stable. When we mention core, we are not talking simply about the abdominal muscles and other related musculature. Rather it is the connection that allows the frame to remain intact as a whole. This being said, the exercise is understanding what tension is needed, and how it is applied in order to keep the vertical and horizontal axes steady and in place within the body, as well as the upper, middle and lower portions of the body stable and connected, creating one fluid connection that runs through the entire body. As you progress and the body becomes connected you will learn to operate the body through the horizontal and saggital planes, making your body the central axis and at the same time creating centripetal forces within your body without disturbing its frame. As you proceed to correct yourself you will learn correct physical principles and absorb them. This exercise, the “Body Axis Walking” training method serves to connect the upper and lower portions of the body together. This training places heavy emphasis on the correct placement of the feet, the mechanics of walking, and allows you to understand what “walking” truly is. Ma-ai (distance between yourself and the opponent) and other concepts involving an opponent are also studied in this exercise.